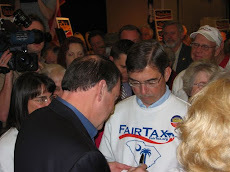 Last night's subject message certainly brought a lot of discussion including WRNJ radio calling me early this morning – within forty five minutes I was part of a program that will be aired re the interrelationship of the debt ceiling problem, the Tea Party, & the FairTax. I will download the audio as soon as it is available & post it on this blog. I congratulate WRNJ – they are a station working for the best interests of America. All day long people called to discuss last night's posting & the overall feeling is that most are mad – we just need to find out with who. One comment – "We felt that in his latest speech Obama presented himself as a victim in a political hassle. The good guy!" portrayed BO as he hopes to be seen as an innocent victim instead of the President with the most power of control. The above graph shows the growth of the payments to individuals by the federal government from 1965 to 2010 – herein lies the problem that we cannot easily turn back without a very large mindset change. 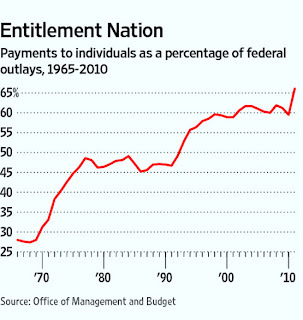 The lead editorial in today's WSJ presented this graph along with the commentary – "This insistence on no reform reinforces the notion that our entitlement state is too big to afford but also too big to change politically. According to the most recent government data, today some 50.5 million Americans are on Medicaid, 46.5 million are on Medicare, 52 million on Social Security, five million on SSI, 7.5 million on unemployment insurance, & 44.6 million on food stamps & other nutrition programs. Some 24 million get the earned-income tax credit, a cash supplement. 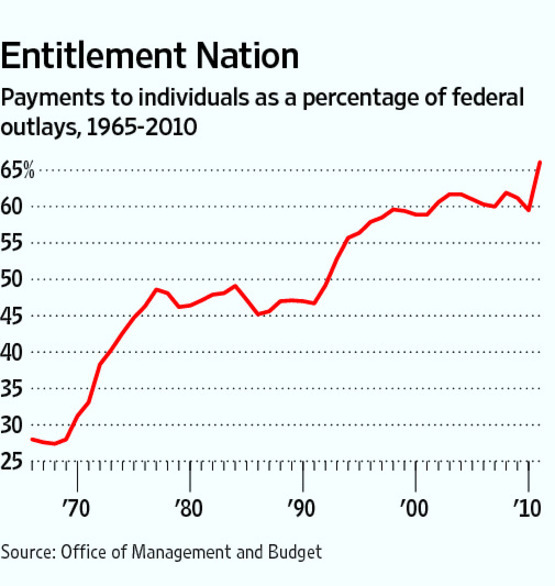 By 2010 such payments to individuals were 66% of the federal budget, up from 28% in 1965." A very wise, long term reader & contributor to these messages, provides the following commentary which describes the Death of Democracy that we see coming into focus more clearly every day. 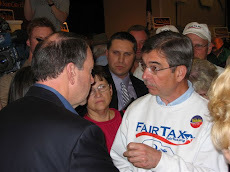 "You hit the nail on the head when you said 70% of the population is for increased spending rather than reducing taxes. Most people ONLY read headlines. You have Obama telling people that Social Security checks might not be mailed in August because of the Republicans, and he gains 80% of retirees' votes for the next election. As for me, I will take a very long nap, lasting for years, unless someone comes up with smart plans that have a chance to work and that the general public believes will work." If some people are collecting all of the listed below are they counted 6 different times or just once, the number might change. Interesting responses....congratulations on being part of the radio program...will look forward to the audio.